Using the VoiceBio software we do three voice tests looking for the pitches that you speak. We can then see which pitches are weak in your voice, and those that you have too much of. These pitches correlate to organs as shown by Kae Thompson-Liu’s research in hospitals over many years. Based on your voice analysis, the missing frequencies are reintroduced into your system on the sound table. This helps to return your system to a balance of all the notes in the octave — a healthy state as shown in research for Alfred Tomatis. When you finish your 1/2 hour VibroAcoustic Treatment on the sound table we also give you the CD to take with you. 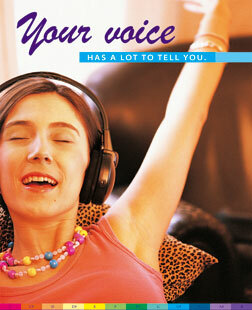 Your voice is a holographic picture of your health. Through the technology of Voice Bio©™, the independent frequencies within your voice can be captured, translated and sorted onto a voice print chart, giving a highly accurate indication of physical function in your body. Good for any specific issues related to organs or diseases. Helpful for emotional issues as well. Good overall balancing of your system. We have many testimonials demonstrating these healing responses. The system does not claim to diagnose or cure. $85 – Assessment and 20 minutes on the sound table with a song in the key of the frequency you need. You also get to take home the CD. Approximately 1 hour total. We do the same Voice Analysis over the phone or on Skype. We then send you a link to download the CD with your missing frequencies. If you would like to have CD mailed to you, shipping is $5 ($20 for International shipping). $65 – Assessment and CD. Approximately 1/2 hour total.